‘I think we must be having two different conversations. I don’t know what on earth you’re talking about with all this sports day nonsense. This, of course it should hardly need pointing out, is a purely fictional conversation but sometimes fiction would be a good deal easier to believe than fact. FIFA’s decision, as had been reported a few weeks previously and which came to fruition this week, to expand their flagship event by 50 per cent from 32 to 48 competing nations belongs in a story book, because it shouldn’t be given the time of day in a world where rational thinking exists. The peak of the world’s most popular sport, the tournament which has for years stood as the ultimate footballing prize, being diluted at the altar of money-grabbing by a gaggle of corporate flunkies is sad to witness. But the most depressing thing about it is the complete and utter lack of surprise. This is an organisation which has happily waded in the filth of corruption for many a year while all the time claiming those on the outside are sorely mistaken. Where a high-ranking executive can buy a flat for his pets, where another can launder money through shopping developments and, this has to be the best of all, where the collective can award their crown jewel to a country only second to the sun in terms of heat. So brazen, so overt and so thoroughly stupid that heavens knows how they have been allowed to get away with it but get away with it they have. 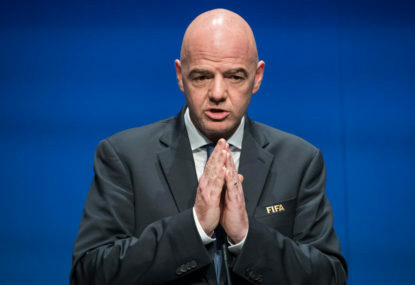 And now we have the successor to Sepp Blatter, Gianni Infantino, deciding that the best way to curry favour, sorry, I mean spread the gospel, is to make a mockery of the big one. So when 2026 comes around, we can expect a mammoth event with an interminable number of group games (plenty of which will be dead rubbers given the thin spread of ability between the protagonists), the possibility of penalty shoot outs (Infantino’s idea you won’t be surprised to hear) and a competition that will only give more credence to the increasingly powerful club game. What should be a gathering of the world’s best will now be a party where kids who aren’t allowed to drink are invited and nick all the chips. It won’t be bad news for a number of nations who will now have the opportunity to dine at the top table but the World Cup shouldn’t be like this, it should be a meeting of the best teams the planet has to offer. And no doubt it will be but you’ll have to trudge through the schedule-filling mire to get to that point. So plenty of cons and not one redeeming feature. But hang on, how foolish of me. How can I miss the very obvious fact that this tournament will generate a huge increase in turnover and profit.